The movie Christopher Robin (2018) starts, and indeed continues for more than half its length, superbly; truly masterly storytelling and inspired, gorgeous visuals - a textbook example of consummate craft in film-making. It then rather degenerates into a kind of 'caper' movie, with chases, last-minute escapes, slapstick, ham-acting elicited from the background characters* - and an inept, unsatisfying ending. It looks like a wonderful script was meddled-with and spoilt in the process of movie-making; it looks as if there was a failure of nerve; it looks very much that an original and unusual but coherent project was (to a significant extent) messed-up en route by dumb, vulgar outsiders insisting upon the insertion of film-school, boilerplate cliches. Not many movies are as good as this one is to start-with - so this very typical pattern of Hollywood failure is even more than usually disappointing. 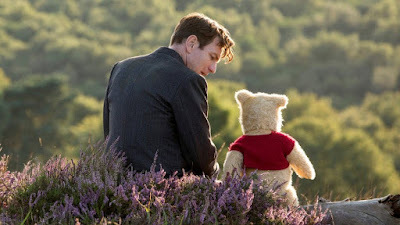 But it is certainly well worth watching the very beginning, which sets-up the situation of the adult Christopher Robin. This is a deft and exact montage of scenes of Christopher Robin growing-up - schools, college, courtship and marriage, army, battles, a child, and peacetime respectable success. This is done - perfectly - by transitioning back and forth between animated versions of the EH Shepherd drawings from Winnie the Pooh, and lovingly luminous recreations of 'real life'. I can honestly say I have never seen a more beautiful celluloid rendition of that England of happy memory. The tough question I take from Christopher Robin is - what does this imply? *Note: When we see 'bad acting' from minor or background characters in movies, this is nearly-always because of the way they have been directed to act - almost-never due to lack of acting ability. These people can act, and very well - it is only, some, stars who can't act. Exceptions are likely due to the evils of the 'casting couch' system.